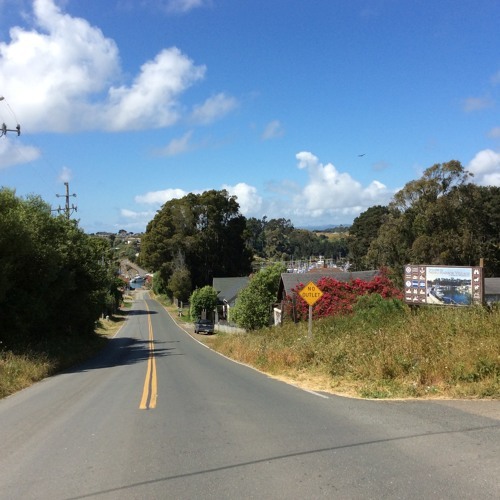 Composed for the album "Summer Home, Volume III - Hacienda," released June 30, 2017. https://summerkarma.bandcamp.com/album/summer-home-volume-iii-hacienda Field recording in park at bottom of hill, Noyo Harbor, Fort Bragg, CA, by John Gilmore. Photo from top of hill by John Gilmore. Commercial use prohibited. Those who profit from this track or album are subject to prosecution. @astrofaros: Thanks, but it was there for the taking. @householdbassline: Thanks so much, especially because this led me to your music, homeboy. @headlab: Short one, too, once you get yourself here one fine day. Thanks. @jonathan_beckenstein: Thanks, and I've been enjoying yours as well. @fleursonseaux: Thanks so much. Glad it conveyed a particular place and time. Very particular soundscape ... nice! @tony-morris-308328247: What a delightful response, but don't let that truck fool you. This area is atypical of this country, and I've seen a lot of it. Maybe this little shapshot does convey our ugly beauty, as that great American Thelonious Monk titled a waltz he wrote. Fantastic photo - so American. @boson_spin: You're too kind, Re length, I made this a deliberate exercise in unwonted restraint so as not to hog undue space on the album. @exc-973155409: Thanks so much. The air isn't frequently hot here, but the sounds were quite close to home. @runninginslowmotion: Thanks so much. I'm very lucky to have such a rich sonic field so near. Feeling hot air, burning sun , and being close to home. Sweet soundscape John. 11/10! @julienalacroix2: Thanks so much, Julien. Download John Gilmore - Down the Road, Into the Yonder - from album "Summer Home, Vol. III" Buy John Gilmore - Down the Road, Into the Yonder - from album "Summer Home, Vol. III"
Users who like John Gilmore - Down the Road, Into the Yonder - from album "Summer Home, Vol. III"
Users who reposted John Gilmore - Down the Road, Into the Yonder - from album "Summer Home, Vol. III"
Playlists containing John Gilmore - Down the Road, Into the Yonder - from album "Summer Home, Vol. III"
More tracks like John Gilmore - Down the Road, Into the Yonder - from album "Summer Home, Vol. III"